This is the story of a fascinating life lived fast, shedding new light on Robert Burns's beliefs, politics, social interactions and the great contradiction between this deeply moral man and his notoriously libertarian lifestyle. ^^Understanding the role of Christianity in eighteenth-century Scotland is key to understanding the enigma that is Burns. Equally, his poetry provides penetrating insights into religious life in Scotland and religion in general. ^^Told chronologically, this story recounts Burns's life from his family's background in Mearns to his early death in Dumfries and his influence beyond. Integral to Burns's life was his relationship with God and religion and the fascinating dilemma of how he reconciled his faith with his lifestyle. - Publisher Told chronologically, this title tells the story of Burns' life from his family's background in the Mearns to his early death in Dumfries and his influence beyond. It discusses his relationship with God and religion and the dilemma - how did this intensely moral man reconcile this with his notoriously libertarian lifestyle? 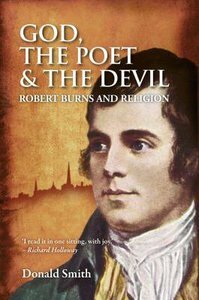 About "God, the Poet and the Devil"
Told chronologically, this title tells the story of Burns' life from his family's background in the Mearns to his early death in Dumfries and his influence beyond. It discusses his relationship with God and religion and the dilemma - how did this intensely moral man reconcile this with his notoriously libertarian lifestyle? Donald Smith is a storyteller, novelist, playwright and performance poet. He has been Director of the Scottish Storytelling Centre since 2001 and of its predecessor, the Netherbow Arts Centre, from 1983. He chaired the Committee which established the National Theatre of Scotland and became a founding Director. He was also first Chair of the Literature Forum for Scotland. He is ther author of God, the Poet and the Devil: Robert Burns and Religion.